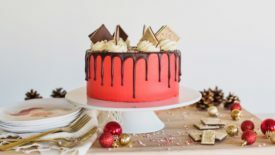 Chocolate Peppermint Cake – rich, dark chocolate peppermint cake layers with peppermint buttercream. It’s another classic seasonal flavor turned into cake today! 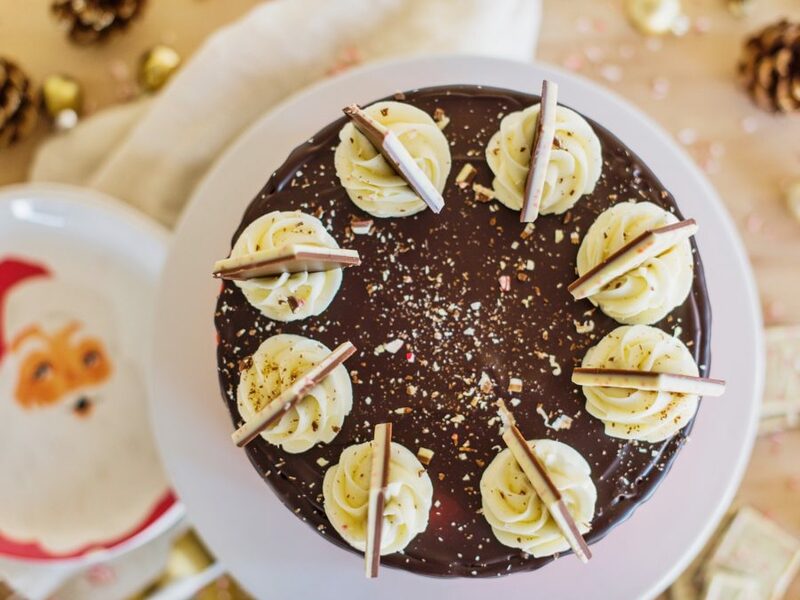 This Chocolate Peppermint Cake is a favorite around here, and I think it will be in your home too! I’ve used my go-to chocolate cake recipe with a little peppermint extract. It’s one of the easiest recipes to whip up. You’ll mix your dry ingredients, then your wet ingredients, and the combine them all. Remember, once you start adding the wet ingredients to the dry ingredients, your mixer should be on low speed. You only need to stir until the dry ingredients are incorporated into the wet ingredients. Over-mixing your batter is one of the main reasons your cake sinks in the center. I only mix my batter for about 30 seconds. Then I scrape the sides and bottom of the bowl, and mix again for another 10 to 20 seconds. Same goes for the frosting. This is my go-to whipped vanilla frosting with peppermint extract. 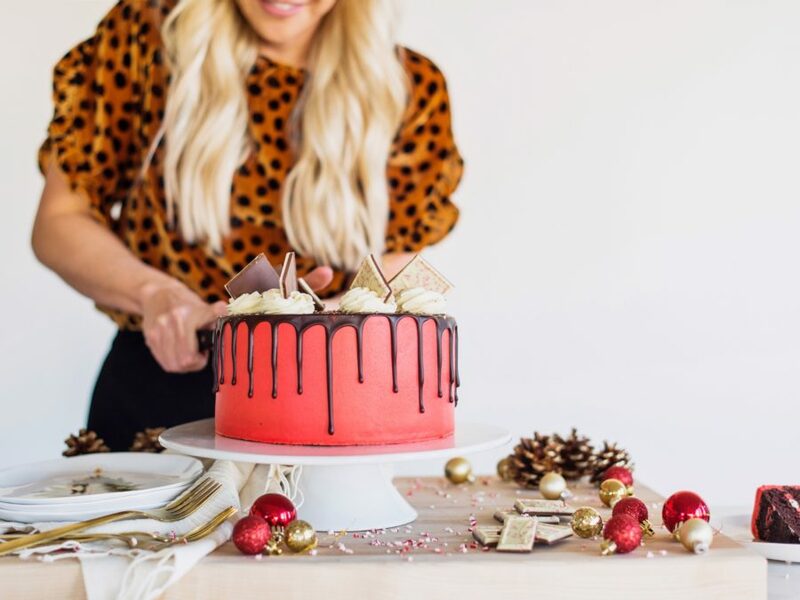 The cake and frosting alone have a great peppermint flavor, but if you want to add a little texture to the cake, break up some candy canes or peppermint bark to add between the layers. They’ll make great decorations for the top of your cake, as well. 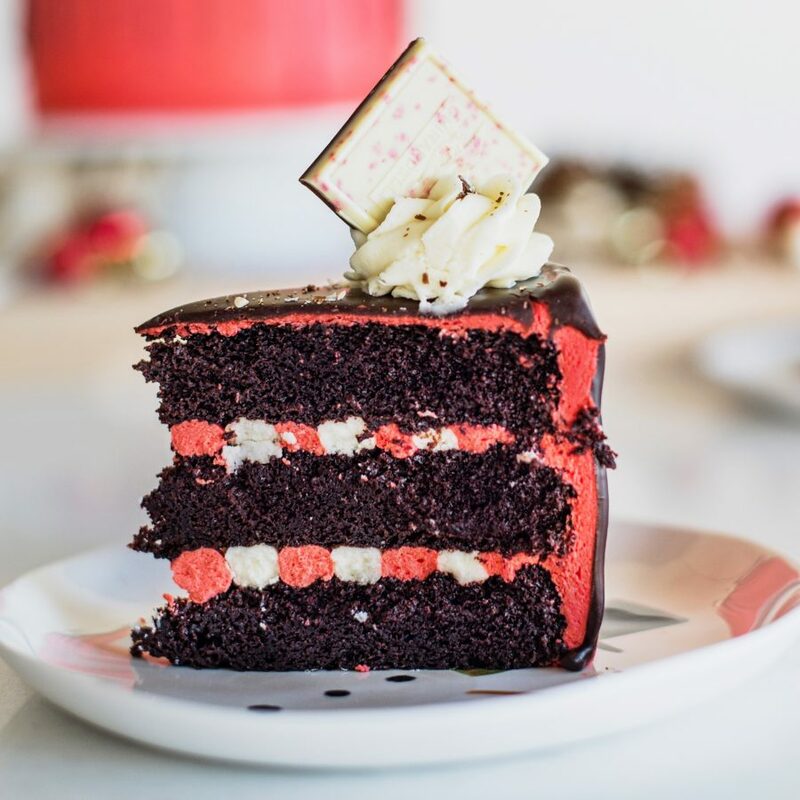 Rich, dark chocolate peppermint cake layers with peppermint buttercream. Preheat the oven to 350 degrees F. Prepare three 8” round cake pans with nonstick spray, parchment paper, and one more spray of nonstick spray. In a bowl of electric mixer, combine all the dry ingredients. Set aside. In a medium mixing bowl, combine eggs, buttermilk, water, oil, vanilla and peppermint and lightly beat with a fork. With the mixer on low speed, add wet ingredients to the dry ingredients. Mix for about 30 seconds. Batter will be thin. Scrape sides and mix for another 10 to 20 seconds. Divide batter evenly among prepared pans (about 15 ounces of batter in each pan). Bake for 18 to 20 minutes (you may need more time depending on your oven), until toothpick comes out with a few moist crumbs on it. Cool on wire racks for 10-15 minutes and then gently invert onto greased racks until cooled completely. When cakes are completely cooled, I like to wrap each cake layer individually with plastic wrap and stick it in the freezer until I’m ready to frost. The cake will be easier to work with if it’s cooled a bit. In the bowl of a stand mixer, fitted with the paddle attachment, beat the butter until creamy, about two minutes. With the mixer on low, add the powdered sugar, one cup at a time, and mix until combined. Add the whipping cream, salt and peppermint extract and beat on medium-high for about 3-5 minutes, until the frosting is light and fluffy. Reserve about 1 cup of frosting for the white stripes in the cake layers. Add red food coloring to the rest of the frosting and mix for another minute. If your frosting has air pockets, take a spatula or wooden spoon and mix by hand until the frosting is smooth. In a microwave safe bowl, heat the cream. Pour the cream over the chocolate chips and stir until the chocolate is melted. After leveling each cake layer, set the first cake layer, right-side up, on a cake plate or board. Using piping bags, pipe alternating circles of white and red buttercream, as seen in the video above. Repeat step one for the second cake layer. Place the third cake layer, bottom-side up, on top of the second layer of frosting. Give the cake an even crumb coat, filling in an areas that seem uneven with frosting. Freeze the cake for 10 minutes. 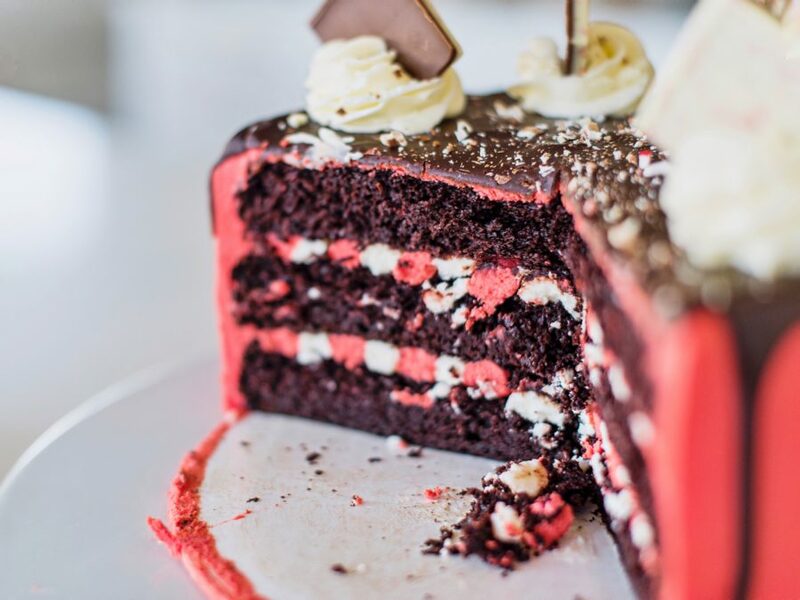 When the crumb coat is set, finish frosting the cake with the red peppermint frosting. Let it chill again before spread the ganache on top. Garnish with candy canes or peppermint bark. This looks amazing! Going to attempt to make it for a party this weekend – thanks. I have 9 inch cake pans. Will this recipe still create a relatively high 3 layer cake using the larger pans? Not with the recipe as is. You can do two 9-inch pans with this recipe or add an extra 1/2 of the recipe for three 9-inch pans. 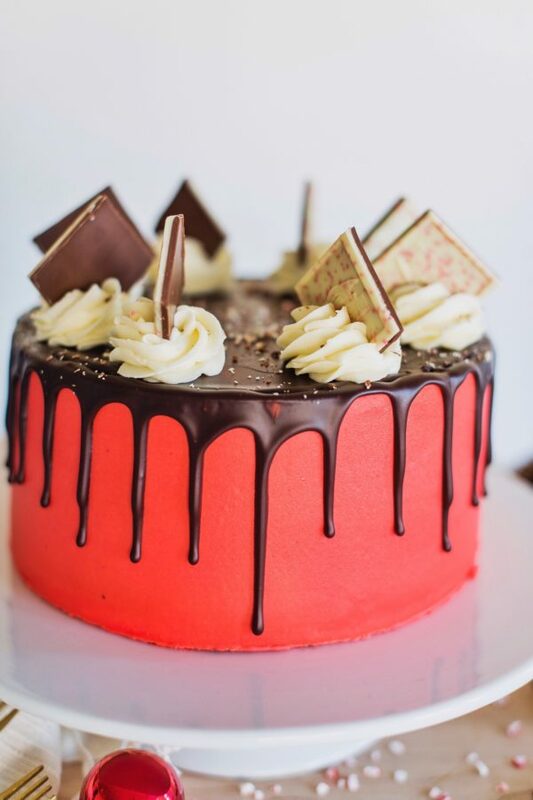 FANTASTIC cake! Made for Christmas Eve and it was a huge hit. The filling was so pretty and a nice little surprise. It was…..perfect, and I don’t give that compliment very often. Thanks Courtney!